The Secret of Monkey Island: Special Edition is a tough one to review. It's not really fair to review the game, is it? That's not fair. The game's 19 years old, and is one of the best ever made. So we won't. Instead, we'll review this as a port. Think of it as your memories of Star Wars versus your impressions of Star Wars: Special Edition. In some ways, it's great seeing an old favourite given a new lease of life. But in others, well. Han shot first. Same Old, Same Old: This isn't a "remake". There's no new 3D tech underpinning the game, no re-written puzzles, no sweeping changes to Ron Gilbert's original vision. Instead, it's exactly the same game. Same lines, same characters. Heck, you press F10 and the game switches between new version and the original, so seamlessly you can do it mid-animation and/or mid-conversation (though you won't get voice acting in the 1990 version). So you know exactly what you're getting: one of the best adventure games ever made, and possibly the funniest as well. New Vision: But it's not quite the same game. It plays the same, but sounds and looks very different. For the first time, voice comes to the original, thankfully (and tastefully) done by most of the cast from the later games, including Dominic Armato as Guybrush . There's also a new, shinier art style atop the game, which in most places looks great, especially the life it breathes into the game's landscapes. Some characters, however, have a lot less…character, a bit less humour to their faces, so it's not an improvement across the board. A Wretched Hive Of SCUMM & Villainy: LucasArts' SCUMM menu system persevered for a decade or so because it was perfect. It served the original well, and it served its sequel well, but this remake does away with it in favour of a weird adaptation of LucasArts' later single-click interface. Some things are activated intuitively with a mouse click, others you have to drag through a cumbersome inventory system. It's a messy problem to face in 2009, especially when you can just hit F10 and be reminded that they did things better back in 1990. Like a night out to go see the remade Star Wars movies, if you're a fan of the original, you'll enjoy the update, as it's nice seeing a rusty old game given a new lease on life. Even if a few of the additions are a little unnecessary. 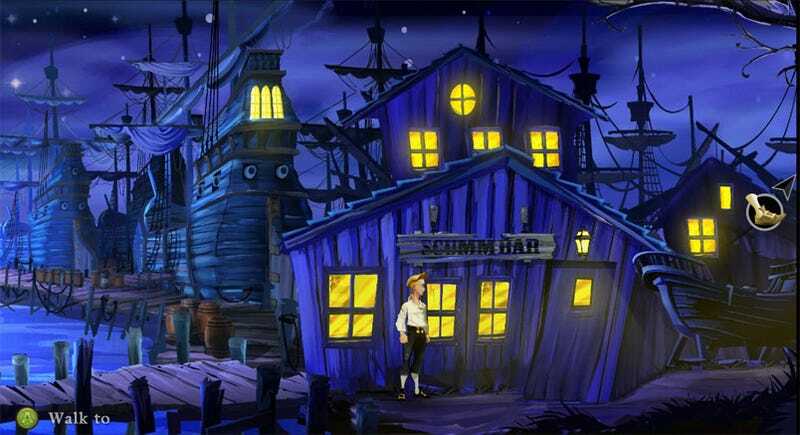 Monkey Island: Special Edition was developed and published by LucasArts, released on July 15 for the PC and Xbox 360. Retails for $10 on PC and 800 MS Points on Xbox 360. Played game to completion for, what, the 17th time now?